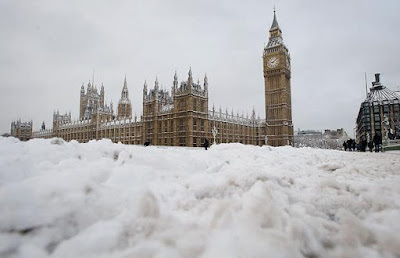 Global Warming Hysteria: 2000—English Children Will Not Know Snow—2010: Oops, Nevermind! Britain’s winter ends tomorrow with further indications of a striking environmental change: snow is starting to disappear from our lives. Sledges, snowmen, snowballs and the excitement of waking to find that the stuff has settled outside are all a rapidly diminishing part of Britain’s culture, as warmer winters - which scientists are attributing to global climate change - produce not only fewer white Christmases, but fewer white Januaries and Februaries...According to Dr David Viner, a senior research scientist at the climatic research unit (CRU) of the University of East Anglia ,within a few years winter snowfall will become “a very rare and exciting event”. “Children just aren’t going to know what snow is,” he said. David Parker, at the Hadley Centre for Climate Prediction and Research in Berkshire, says ultimately, British children could have only virtual experience of snow. Via the internet, they might wonder at polar scenes - or eventually “feel” virtual cold. Heavy snow will return occasionally, says Dr Viner, but when it does we will be unprepared. “We’re really going to get caught out. Snow will probably cause chaos in 20 years time,” he said. The chances are certainly now stacked against the sort of heavy snowfall in cities that inspired Impressionist painters, such as Sisley, and the 19th century poet laureate Robert Bridges, who wrote in “London Snow” of it, “stealthily and perpetually settling and loosely lying”. The latest snowfall carpeted large swathes of Britain today - with up to 5in falling in places - paralysing roads and rail, and forcing airports and schools to close. Forecasters warned the worst was still to come over the next 24 hours as the heaviest December snowfall for 30 years tightened its grip on the nation once more. The South is expected to be worst hit with up to 10in falling during the course of tomorrow. By the start of next week temperatures are set to fall to as low as -15c (5f). Met Office forecaster Barry Gromett said the average mean temperature for the first two weeks of this month was -0.7c. The coldest ever average for this time of year - recorded in December 1981 - was 0.2c. ‘It is going to remain very cold right through to the middle of next week with widespread overnight frosts and ice. ‘Temperatures are likely to drop into the minus teens in places, with towns and cities as cold as -8c (18f). ‘It’s going to stay like this throughout Christmas and New Year, but by the middle of next month things will slowly return to normal and we could perhaps see the beginning of the end. ‘Nevertheless, this December is almost certainly going to become the coldest since records began in 1910. See, that’s what trying to panic people with GWH gets you: By making dire predictions you cannot know to be true, you can easily end up looking very foolish. There’s some juicy justice in that comeuppance.